One of the main appeals of Smartsheet is the ability to easily collaborate with coworkers. Smartsheet is similar to Google Drive in that numerous people can view and edit one document at a time via the cloud. With Smartsheet, you can share a sheet to fellow coworkers who can simultaneously collaborate and communicate via Smartsheet. Smartsheet allows you to share not only your spreadsheet but also any files or comments you attach. This allows collaboration through convenience as all communication and file sharing is done in one location. Smartsheet’s visibility is unprecedented as you are easily able to view and process information. The customizable organization of Smartsheet allows you to alter how you view information depending on if you want to focus on the big picture or details. 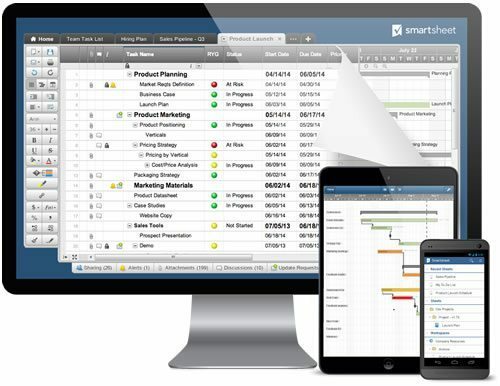 Another feature of Smartsheet is the addition of Gantt charts. Gantt charts allow you to allocate tasks to certain individuals and highlight the importance of each task on the big picture. The visual aspect of Smartsheet saves precious time and allows you to allot more of your time to developing your business and less time entering and analyzing data. In Smartsheet, you can set reminders and alerts to remind your team about upcoming tasks and deadlines. Smartsheet’s calendar is another useful feature that helps keep your team on track and on top of deadlines. The calendar can be linked to your Google Calendar or iCal to overlay project dates. This implementation of a calendar and the use of reminders helps ensure tasks get done properly and on-time. So follow this link: https://www.smartsheet.com/try-it-b?trp=751 to try Smartsheet out today for free. The abilities Smartsheet offers are incredible, and upgrading to Smartsheet can truly revolutionize the way your business works and collaborates.